Tubular salvia blossoms are spectacular in hot magenta pink, against dark green foliage and maroon stems. Upright clumps are in full glorious display from May to October, oblivious of heat and drought. 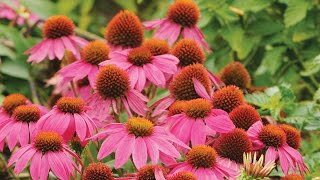 Provide well-drained soil and full sun. U.S. Plant Patent #21,889. Salvia may be grown from seed sown early indoors and transplanted outside after frost, sown directly in the garden in summer, or grown from potted plants. Sow indoors 10-12 weeks before the last frost. Barely press the seeds into seed starting formula. Keep the soil evenly moist at 70 degrees F.
If you are growing salvia in small cells, you may need to transplant the seedlings to 3 or 4 inch pots when seedlings have at least 2 pairs of true leaves before transplanting to the garden so they have enough room to develop strong roots. Before planting salvia out in the garden, seedling plants need to be “hardened off”. Accustom young plants to outdoor conditions by moving them to a sheltered place outside for a week. Be sure to protect them from wind and hot sun at first. If frost threatens at night, cover or bring containers indoors, then take them out again in the morning. This hardening off process toughens the plant’s cell structure and reduces transplant shock and scalding. Seedlings will emerge in 15-21 days. Thin to 12-18 inches apart when seedlings are about 2 inches tall. Keep weeds under control during the salvia growing season. Weeds compete with plants for water, space and nutrients, so control them by either cultivating often or use a mulch to prevent their germination. Careful watering is essential in getting salvia perennials off to a good start. Water thoroughly at least once a week to help new roots grow down deeply. Soil should be damp at about 1 inch below the soil surface. You can check this by sticking your finger in the soil. Water early in the morning to give all leaves enough time to dry. One inch of rain or watering per week is recommended for most perennial plants. You can check to see if you need to add water by using a rain gauge. 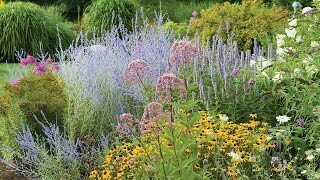 These versatile, colorful plants are widely grown in mixed borders, formal mass plantings, wildflower gardens, cottage gardens, and containers. Salvias make great cut flowers. Salvia, Wendy's Wish is rated 5.0 out of 5 by 2. Rated 5 out of 5 by Rachel S from Grows strong & big, bringd the hummingbirds These were pretty small when I put then in the ground, first week of May. I put 3 in front of my living room picturr window, 2 ft apart. Fast forward to mid-July and they are huge! The branches have spread out to cover the whole area, just this morning I was looking for where the branches originate from, because its hard to tell anymore. I like to sit on the floow in front of the window and watch the ruby throated hummingbirds come around. They cant see me because of the window reflection and they'll eat for a few good minutes, come really close to me, and just hover. The one downside to these is the flowers are delicate and fall off easily. I've yet to see a whole stem fully flowered, just because they fall off. Doesnt help that the yellow finches try to sit on the stems. Will definitely be buying these again. Rated 5 out of 5 by Tammyk from Healthy plant For some reason these were hard to find this year, but Burpee had them. I use this Salvia as my center piece in my large planter along with a kong coleus and lime green potato vine. It is beautiful and hummers love it.